Live From the Red Carpet is a free Windows 8 celebrity news app, and this is the official client app of E! Entertainment. This app helps you stay updated with all the hottest Hollywood news and the news related to your favorite celebrities. 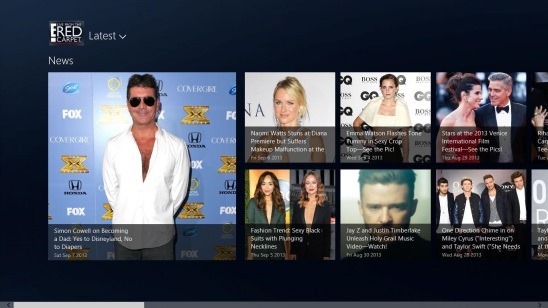 This Windows 8 celebrity news app lets you have a total access over the Hollywood’s hottest events right from your Windows 8 Start screen. Using this app, you can now follow the fashion, stars, all the glitz and glam, awards, premieres, and various shows. 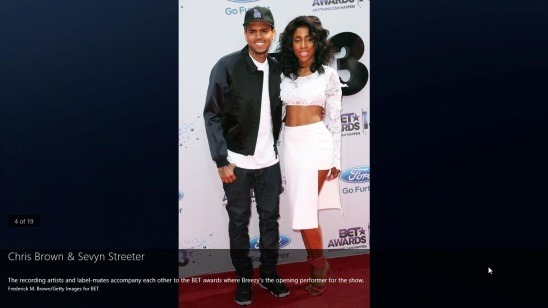 This Windows 8 celebrity news app gives you the quickest, essential, and peculiar celebrity news stories and gossips. You can read the News stories, watch videos, interviews, and View photos. Besides that, you can also use the Windows 8 Search, Share, and Settings Charms within the app. If you are a big time follower of a celebrity or an event, and want to know almost everything that’s going on with them, or you are a E! fan/viewer then, this is the app for you. 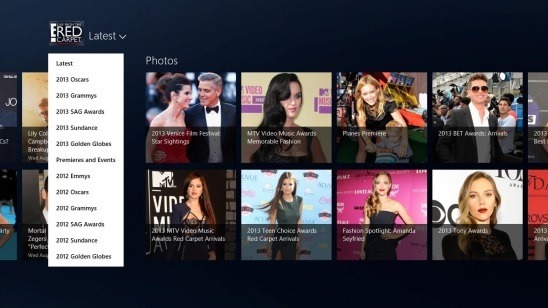 In order to get this Windows 8 celebrity news app on your PC, go to the Entertainment Category in Windows Store and browse for the app. You can also use the Windows 8 Search Charm to get the app in Windows Store. Like I said before, this is the official client app of E!, so everything that’s available on the official website is also available in this Windows 8 celebrity news app. The app gets updated on regular basis, so the news stories are pretty fresh. The celebrity gossips are fun to watch. Plus you can also know what’s the latest trend among celebrities. There are hundreds of articles on various news stories related to celebrities, award shows, best and worst moments of the shows, etc. The moment you launch the app, you’ll get the Main Screen. It consists of two categories/labels: News and Photos. There are multiple news stories under these two labels. I liked the fact that the news are listed as big image rich tiles, with a good headline and the date when it was published. The stories under the News label, basically contains more of the news content and less photo. And in opposite fashion to that, the Photos label contains more of the images and less news content. Besides these two labels, there’s also a Drop down list button besides the app logo. Clicking on this button opens its item list. The items are basically different award events held throughout the year. Reading news stories within the app was a good experience. The stories are as crisp and sharp as possible, taking out all the boring stuff. Using the app is pretty easy, there’s no signup or login required. It is just flat simple and straight. Navigating between Main screen and the stories screen is easy. Though I missed the pinning feature of Windows 8, and also marking the stories as favorites is missing. Clicking on a news, opens that news screen. I liked the fact that the app lists down all the other news at the left side on this news screen. Rest of the screen is covered by the main story. This not only makes finding other similar news easy, but also, there’ll be no need to continuously jumping between stories and main screen. Follows a screenshot of Sharing the news using the Windows 8 Share Charm. Good Windows 8 celebrity news app. Read latest news about Hollywood events, shows, celebrities, etc. View photo stories and videos. Supports Windows 8 Share, Settings, and Search charms. Live tile at start screen. Follows a screenshot showing the search results within the app. 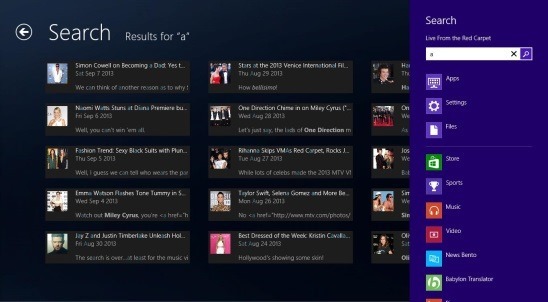 Live From the Red Carpet is fine Windows 8 celebrity news app. The app does what it advertises, though it doesn’t updates as frequently as the website does. But it is nicely integrated with Windows 8 features. Viewing photos and stories was a good experience. The features are pretty strong, all in all, it’s a good free Windows 8 app to try. Also check out these free Windows 8 news apps: BBC News Mobile and The Hacker News. Get Live From the Red Carpet here.